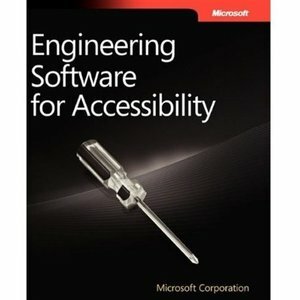 Microsoft Corporation, "Engineering Software for Accessibility"
Discover how to create accessible Web sites and software by planning for accessibility from the beginning of the development cycle-with design guidelines straight from Microsoft. This guide walks you through the process of reviewing the specification to create an accessible tree and identify keyboard navigation requirements. Learn to use the tree to determine where to apply common controls and when to create custom controls. Decide how to code controls and estimate implementation time for product development. And familiarize yourself with the basics of accessibility, including color contrast, font size, the handling of images, and systemwide settings.